Home > Shop By Brand > GTechniq Exterior Coatings > GTechniq I1 Smart Fabric AB 500 ml. New & Improved! GTechniq I1 Smart Fabric AB 500 ml. New & Improved! New & Improved GTechniq I1 Smart Fabric AB now features an antibacterial formula that will kill 99.9% of bacteria on the treated surface! GTechniq I1 Smart Fabric AB is a nano-based coating that blankets your vehicle’s fabric upholstery with the best protection available. Formulated to resist staining caused by coffee, wine, blood, soda, and pet urine, GTechniq I1 Smart Fabric AB is one of the best investments you can make in interior care. Application of GTechniq I1 Smart Fabric AB is as simple as spraying on and walking away! GTechniq I1 Smart Fabric AB has proven to offer 5 times the durability of other fabric protectants, making it an ideal choice for busy families that don’t always have time to re-apply a fabric protectant every couple weeks. GTechniq I1 Smart Fabric AB was formulated to be applied to all fabric surfaces, including those found around the house. GTechniq I1 Smart Fabric AB coats each individual fiber, leaving the breathability and the feel of the fabric unaffected. Stale air is allowed to escape from the fabric keeping it fresh; however at the same time water or oil-based liquids are instantly repelled from the surface. GTechniq I1 Smart Fabric AB only takes minutes to apply – simply spray on and walk away! 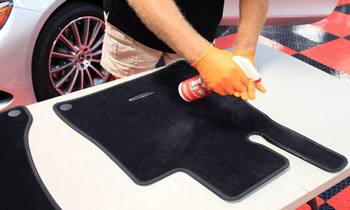 Before protecting your fabrics and upholstery with GTechniq I1 Smart Fabric AB, clean them up with GTechniq Tri-Clean! 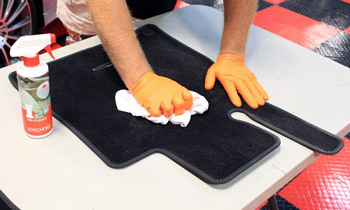 Use GTechniq I1 Smart Fabric AB on fabric seats, carpeting, shoes, convertible tops, couches, clothing, and other textile surfaces. Not for use on suede or leather. GTechniq C6 Matte Dash 100 ml. GTechniq Crystal Serum LightGTechniq Crystal Serum Light 50 ml.GTechniq EXO and CSL KitGTechniq EXO Ultra Durable Hybrid Coating 30 ml. New & Improved v4!GTechniq EXO Ultra Durable Hybrid Coating 50 ml. New & Improved v4!GTechniq C1 Crystal Lacquer 30 ml.GTechniq C1 Crystal Lacquer 50 ml.GTechniq C1 Crystal Lacquer 250 ml.GTechniq C2v3 Liquid Crystal 500 ml.GTechniq G-Wash 250 ml.GTechniq G-Wash 500 ml.GTechniq Quick Detailer 250 ml.GTechniq Quick Detailer 500 ml.GTechniq I2 Tri-CleanGTechniq G4 Glass Nano Polish 100 ml.GTechniq L1 Leather Guard AB 100 ml.GTechniq L1 Leather Guard AB 500 ml.GTechniq C6 Matte Dash AB 100 ml.GTechniq I1 Smart Fabric 250 ml. New & Improved!GTechniq G1 Clear Vision Smart Glass 15 ml. I've tried Chemical Guys and Optimum fabric protectors and neither of them do squat. I would give this stuff 5 stars if it was just a tad cheaper. Works insanely amazing, not sure about longevity but water beads up on my couch now and runs right off!